About every month or so, I have a baking day. Cannon’s diet is so complex and difficult to execute. So, I like to have a baking day to stock my freezer with items I can pull out easily. This weekend, I planned out what I was going to make and shopped for ingredients on Saturday. Then, I spent Sunday afternoon and evening cooking away in my kitchen. 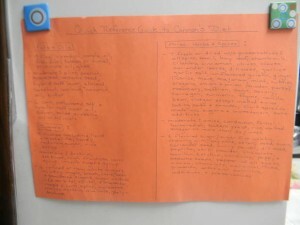 “The Kid Friendly ADHD and Autism Cookbook” saves my life! It is my go-to cookbook due to its sheer volume of recipes, ease of preparation, and visible listings of what common allergens each recipe contains. Cannon’s doctor has prescribed a diet free of dairy, wheat, gluten, soy, corn, refined sugars, and all artificials (colors, preservatives, and flavors). He says that the gluten and refined sugars, in particular, feed the specific intestinal bacteria that Cannon has. There are also other restrictions outlined in a diet that he gave me. 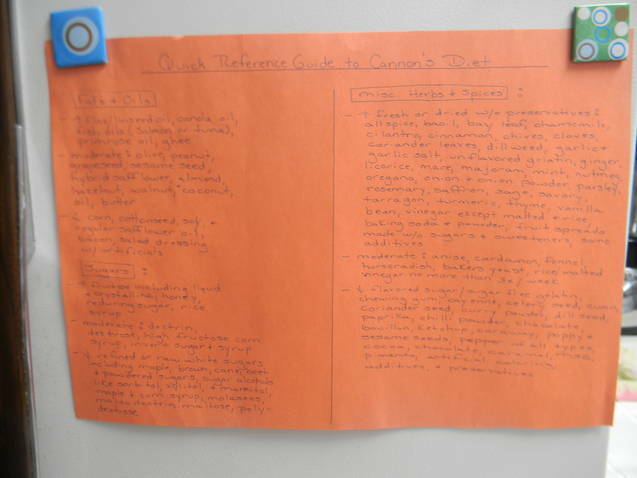 I summarized it (yes, this is the summarized version sadly enough) in a chart for my fridge. I had a good cry over the diet when I first received it but then had to buck up and figure out a way to deal. And one of the ways I deal is by making quickly re-heatable foods for my freezer. So that I am not constantly having to make complex food from scratch at every meal. On this particular baking day, I decided to make banana muffins, 2 kinds of veggie muffins, chicken nuggets, and meatballs. I began by whipping up a batch of banana muffins and got them in the oven. To make these ok for Cannon, I use quinoa and brown rice flour along with xanthan gum and tapioca starch to replace key gluten-filled ingredients. 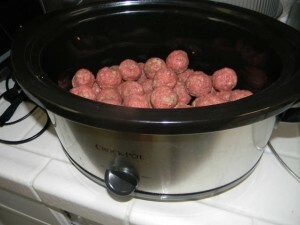 While they were baking, I put together and rolled out a whole heap of meatballs and got them going in the Slow Cooker. These contained organic beef and gluten free casein free (GFCF) brown rice bread among other things. Then, I got some batter ready for my first batch of veggie muffins. They contain a GFCF cake mix, carrots, zucchini, and GFCF chocolate chips. The boys go crazy for these! After my first 2 batches were done cooking, I got my last batch ready for the oven. These contained a puree of carrots and green beans along with organic applesauce. When those were getting toasty in the oven, I finally began getting my last recipe together. These are awesome but they take forever! The Chicken Nuggets! I chop up about 6 large chicken breasts, dip each small piece in an egg and rice milk mixture, and “bread” them in crushed up Sea Salt Kettle Chips. (The latter are great because they are solely made of potatoes, safflower oil, and sea salt.) The finishing touch is to drizzle them with ghee (clarified butter with the dairy element removed). 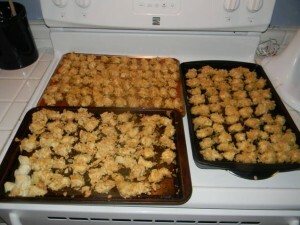 These really taste great and the recipe makes 3 large trays of them. 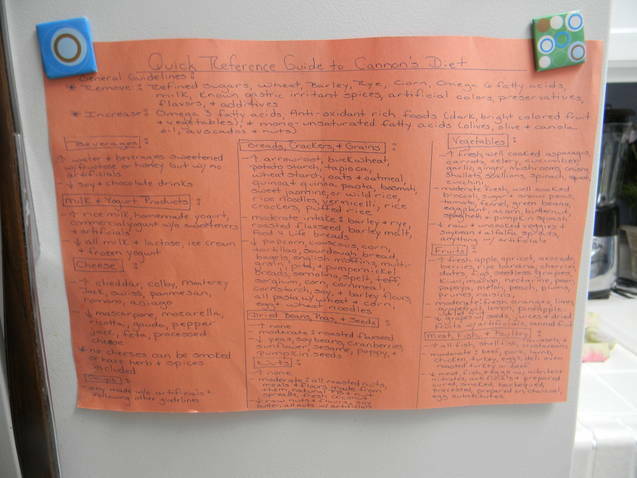 Really all of these recipes are not as bad as you may think. They may not be my personal first choice of something to eat but they are not a bad substitute. And Cannon is such a trooper that he eats most anything. By the end of my baking day, I was wiped but took a break before forcing myself to tackle the dishes. If you are going through something similar to what we are…..please consider what I do as an option. It makes day to day life so much easier. If I am tired and don’t feel like making waffles or pancakes one morning, I reheat some banana muffins. If I need something for a quick lunch or dinner for the boys, the meatballs and chicken nuggets are perfect. And I use the veggie muffins as a occasional side at dinner or a special treat. I also always have a batch of GFCF cupcakes frozen. So, whenever we have a birthday party or school function where there will be sweet treats…..I can reheat one quickly and bring it with me! This makes life and the diet so much simpler to handle. Check out the fruits of my labor! 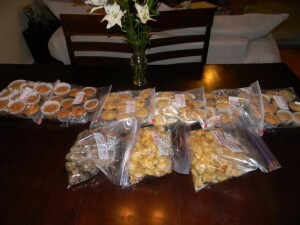 2 dozen banana muffins, 2 dozen of one type of veggie muffins, and 2 dozen of another. Somewhere around 180 chicken nuggets, and a whole bunch (I have no earthly idea) of meatballs. Not bad for a days work and a recipe for an easier next month! God bless you my friends! I have often wondered how you deal with the diet side of things . . . very interesting post! Thanks for sharing! And thank you for reading and following the goings on of our little family! Your friendship is such an amazing blessing to me! Thank you for always being so supportive! Love ya! It actually sounds quite yummy! 🙂 You are so smart to prepare ahead the way that you do! I hope that others will take note!